» Merry Christmas from TheBeyoncéWorld.com! The Beyonce World Merry Christmas from TheBeyoncéWorld.com! The Beyoncé World staff wish you a Merry Christmas!! We hope you guys enjoy this night and this amazing occasion spirit. #throwbackDC we would love to offer “8 Days Of Christmas” music video and thanks Beyoncé for the amazing work she is been doing to Beyhive and for the surprise new album which was the best Christmas gift ever. 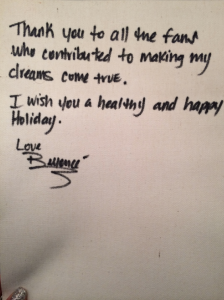 Also, Beyoncé herself sent us a message: “Thanks you to all the fans who contributed to make my dreams come true. I wish you a helthy and happy holiday. Love, Beyoncé”. (Check it above). The Beyoncé World – Staff.